When you buy a water filter, you want to be sure, that it works as advertised. Well, big surprise, it often does not. Most of the times it is not just the manufacturers fault. Water filters are tested under ideal conditions with small amounts of water. In contrast, at home your water filter have to work for a long time, and under varying conditions. First of all, the quality of your tap water will most likely be different from the one the filter was tested with. Some contaminants or high turbidity can decrease your filters ability to do its job and you may have to exchange the filter media earlier than you hope. Take carbon filters for instance. All carbon filters - no matter what kind of carbon - can only absorb a certain amount of contaminants. Once they are „full“ they can not remove any more of the unwanted stuff. On the contrary, the concentration of some contaminants may even be higher in the filtered water because the filter starts to release contaminants. Hint: Pay attention to your filters life span and change it regularly. Some filter systems have filter change indicators to help you keep track. Bacteria can grow on some filter media. Often silver is mixed with the filter medium to prevent it. As it is a chemical process, there is a point in time, when this no longer works. Another factor is temperature. In winter your water may be colder than in summer. Make sure that you get a water filter for the temperature range you have at your house. Also the pH level of your water will seldom exactly match the value the filter was tested with. Temperature and pH can both influence the performance of your filter. Especially the fluoride reduction ability depends heavily on the waters pH. Same is true for water pressure. Many filters rely on a certain amount of water pressure to work. If it is too low, the filter system will produce less water than expected. If it is too high, the filter media may not have enough contact time with the water for the chemical processes to work properly. Good news for gravity filter owners: This is not a problem you have to deal with. All these reasons for poor contaminant removal you can avoid if you choose the right kind of filter for your environment. Check the conditions of your water at home before you decide for a certain model. Their ideal working conditions often differ. By selecting one that is closest to what you have in your home, you have a high chance that your filter will work as intended. Finally, your filter may have a production related defect or got damaged during transport. 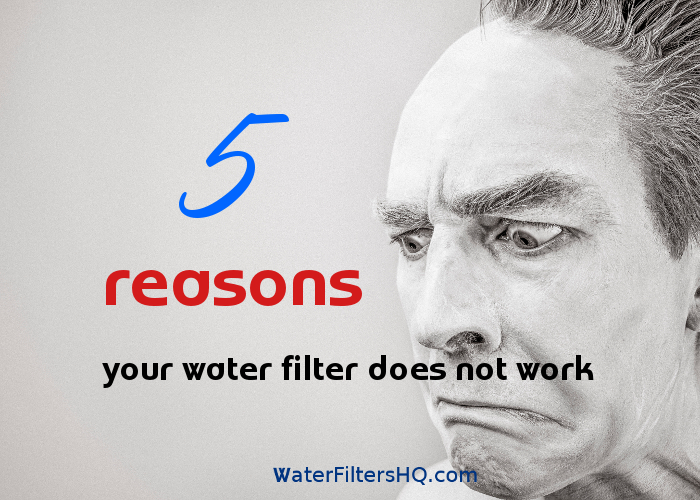 While this is seldom, it is always a possibility to check if your water filter does not what it is supposed to do. Cracks are the most obvious defaults, while leaking can have various reasons. Maybe the adapter does not fit or is not screwed on tight enough, washers are missing, the filter has a crack and many more. In this case, you can't do much yourself. I would contact support and hope that they provide me with a free replacement. Some manufacturers are more generous with their replacement and spare parts than others. It may save you some grief and money to buy a water filter covered by a warranty for all parts.